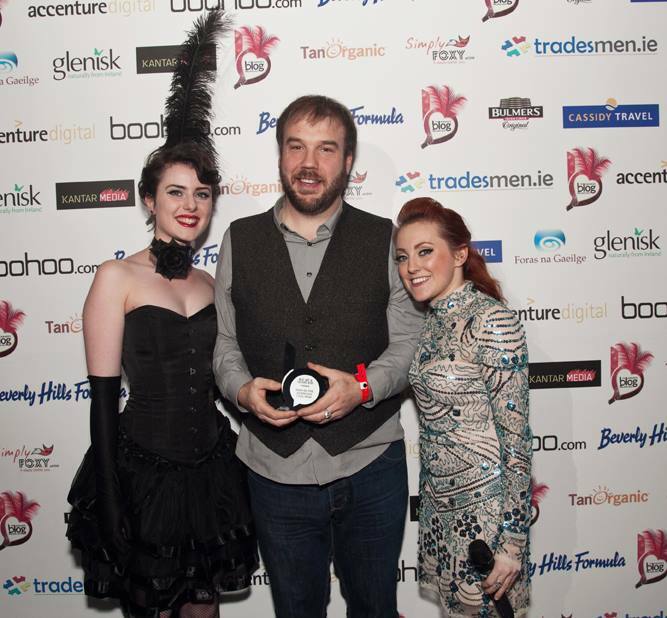 Last night I attended the Blog Awards Ireland awards at the Tivoli Theatre in Dublin. Having spent much of the week working on an archaeological excavation on Bere Island off the West Cork coast, my day started with a ferry journey back to the mainland, before covering the near 400 km to the capital. 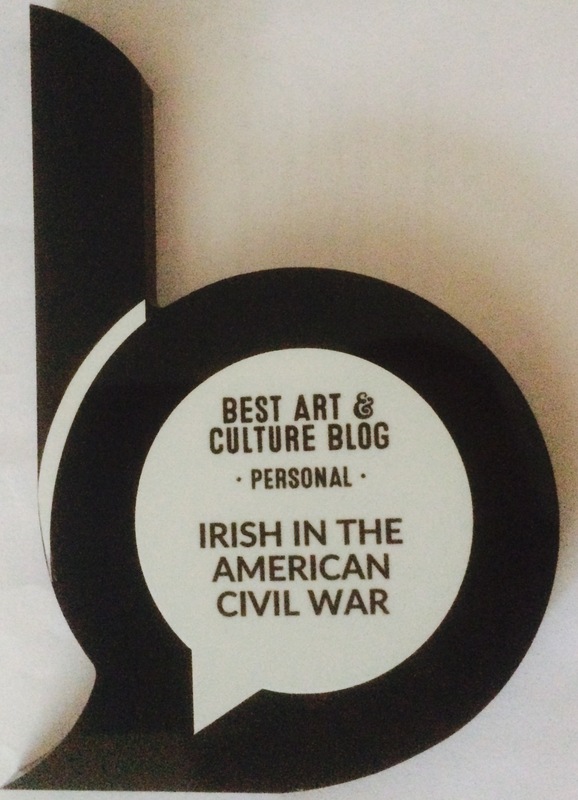 However, the long hours traveling proved well worth it, as I am delighted to say that Irish in the American Civil War was awarded best blog in the Arts & Culture Category (Personal). The event itself was a wonderful occasion– an inspired blend of awards ceremony mixed with burlesque performance, with some superb food and music thrown in. Great credit is due to the Blog Awards Ireland team for putting on such an excellent show. I was genuinely surprised and delighted for the site to receive this honour, as it was up against some strong competition (including my good friend Louise’s Pilgrimage in Medieval Ireland). The fact that a site focused on the stories of these emigrant Irish could win such an award speaks volumes to how much progress is being made on raising awareness within Ireland of these people’s lives. This increased historical visibility is the product of the efforts of a large number of dedicated scholars and enthusiasts throughout Ireland, America and beyond. It would be remiss of me not to not only thank them but also all of you, who not only read this blog but continually support it at every possible opportunity. Many of you voted to help the blog make it through to the final judging round, and I have been genuinely overwhelmed by the good wishes I have received from so many of you. Here’s hoping for many more years of the interaction on the site which has thus far provided me with not only a great deal of inspiration, but also many new friendships. It is what has made the last five years of blogging such enjoyable ones! Well deserved Damian, congratulations and well done. Great to see you getting the recognition for a powerful site and all your efforts. Thanks Michael I appreciate it! Delighted for you, Damian. Well done and totally deserved. Great news for two connected reasons……excellent blog and critical awareness raising. So Sir, congratulations. Heartiest congratulations, Damian. Thrilled that your great work has got this recognition. More than well-deserved. Congratulations! A worthy blog – a strong voice and advocate for the Irish..
Well done and well deserved! Your blog is consistently excellent – meticulously researched and engagingly written. 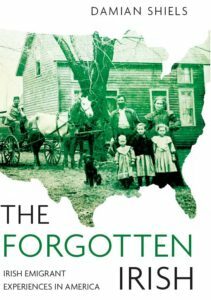 As another “true believer” in telling the story of the Irish in the American Civil War, well done. Well done, Damian! Your blog is such a useful and readily accessible resource for anyone in Ireland trying to find out about the Irish angle in the American Civil War! Hopefully local tourist organizations will pick up on this and identify the places where some of these soldiers came from in Ireland! Congratulations Damien. I really enjoy your blog and am glad that someone is endeavoring to secure the proper recognition and honor that these men deserve. Thanks Allen, I appreciate that! Congratulations Damian, Its a wonderful blog, and I enjoy reading the stories. I am delighted for you Damien. You truly deserve this award, if only for the life you have breathed back into those brave Irish men and women who found themselves embroiled in both sides of America’s Civil War. Well done you and thanks for a wonderfully researched and entertaining blog. Thanks Brian, I appreciate you reading and the support! Thanks Johnny I appreciate that!